Just Dance! 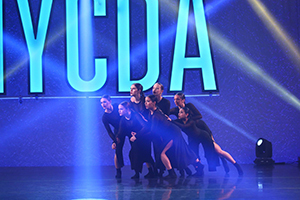 Company is Charleston Dance Center’s most elite competition level. Our dancers, age 5 to 18, compete across the country at regional and national competitions and conventions. Requirements increase with the dancer’s age and ability levels. See individual team pages for the requirements at each age/skill level. Just Dance! Collective is also a Charleston Dance Center competition team. Our dancers, ranging in age from 8-15, compete and perform locally. Collective dancers receive an equally high level of training, but their commitments are more flexible, allowing them to participate in other activities in addition to dance. The Just Dance! competition dance team was founded in 2000 under the direction of Buffi Wade. Since then, the company has continuously grown. In 2016, Lindsey Gentry was named the co-director of Just Dance! Company. In 2019, the Just Dance! Collective was founded by Buffi and Vanessa Henry. In the past 20 years, Just Dance! companies have participated in the Performer’s Showcase at the Broadway Dance Center in New York City, provided the children’s cast for the Moscow Ballet’s Great Russian Nutcracker and Charleston Christmas Special, participated in a dance pilot for MTV and performed in the Piccolo Spoleto Festival. We are focused on training well-rounded dancers who perform age-appropriate skills and routines. Our goal is for all our dancers to reach their full potential. Although Just Dance! competition teams and dancers have won dozens of national titles, winning isn’t everything. It is far more important to us that our dancers build their self esteem, confidence, and are humble and polite. As much as we work with our dancers on technique, we spend the same amount of time teaching them backstage etiquette and the importance of treating all competitors with respect and kindness. The skills our dancers learn will help them to be successful in anything they do – whether they strive to dance professionally or become a lawyer. They are learning how to manage their time and understand the results that hard work and discipline can bring. They are learning how to work as a team as well as building lifelong friendships. Read what Just Dance! parents say about competition dance.